Can I continue to play music with the screen locked? Yes, as of version 1.2, Shuffle By Album will continue to play while the screen is locked, if you’ve turned on this option! Press the … on the main screen and follow the on-screen instructions. What happens if I’m playing music already and I start Shuffly by Album? As of version 1.2, the current song’s album becomes the “current album”. After that album finishes, the next random album will be played. I left the application and the music stopped – why? You have to turn on Shuffle while locked! See the first FAQ. I want to change apps while the music is playing and I have Shuffle while locked turned on – how do I do this? Good question. If you have Shuffle by Album on the screen and you press the Windows key, music will continue to play. If you return to Shuffle by Album, before the album ends, you will restart the application, and shuffling will continue as expected. If the album ends before you come back to Shuffle by Album, no new album will start; the application isn’t actively running when it’s not on-screen! How to I quit the application entirely? You can end Shuffle by Album by using the Back button on the main screen. Can I change the volume of the music? Yes, using the Windows Phone volume buttons. How can I change tracks? If you tap the current album art or text of the current album or song, you will be shown a track list; tap whichever song you want and press the Back button on the handset to return to the main screen. Why do I see more than one album cover at a time? The center album is currently playing album. The one to the left is the album that you just played and the one on the right is what’s coming next; tapping either of these will bring you to that album. Tapping the right album to select the next album will always show you a new random album; tapping the left album will use the last albums played. How random is the album selection? It’s as random as a computer can be, so random that if you don’t have much music on your phone, you might get the same album twice in a row. How can I rewind/fast forward in the current track? Press either of the volume buttons on the phone itself and the Audio Control will slide down; from there you can press and hold either Prev or Next to rewind/fast forward in the current song. Why can’t I use this application while I’m syncing with a computer? 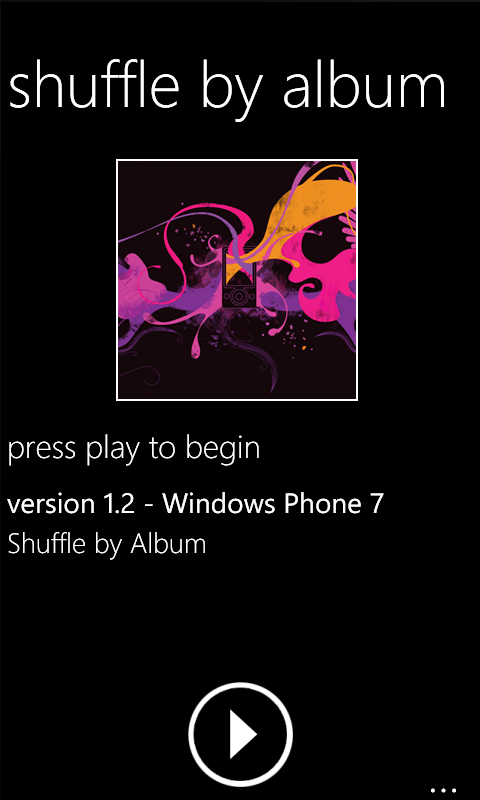 Since Windows Phone 7 uses Zune itself to sync with computers, it cannot access the Zune music collection while it’s trying to build it. After you’ve completed your sync, you can restart Shuffle By Album.